Same comic uploaded years ago, but now with bigger&better scans of the stories, and fc+bc from HAG. Comic Story (9 pages) The Birdmen of Konkorra Cliffs! Synopsis: An ancient Roman treasure is discovered near the bird men's country. Kaänga prevents it from being taken by thieves so that it can be placed in the hands of the proper authorities. 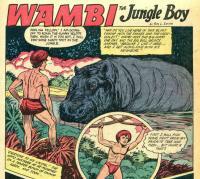 Synopsis: Wambi is captured by a well-meaning couple who want to civilize him. He is rescued by Tawn and Ogg. Synopsis: Jim describes the ferocity of the Cape buffalo to an inexperienced hunter. Synopsis: Having been offended by the Nygumbars, Judson hires warriors from all over the jungle to attack the Nygumbar kraal. Tiger Girl comes to the aid of the Nygumbars and Judson's force is defeated and he is killed by Benzali. Credits: Inks: Jack Kamen ? ; Ed Waldman ?